Terrie’s messages and lessons require Acrobat Reader These items were placed on the website in 2005 – 2006 and are applicable for use any race year. View all of Terrie’s lessons in this PDF booklet. Read the Summer Conference Newsletter Meet Terrie Hanke and discover the events that took place at the 2005 Summer Conference. Where men are men and women win the Iditarod! The adventure of a lifetime, the highlight of a professional career, an unbelievable journey, a transforming experience – try as I might, there are no words that can thoroughly or adequately summarize my journey as the 2006 Teacher On The TrailTM. I’m not the only person who is at a loss for words when it comes to describing time spent on the Iditarod trail. Rookie, Chad Schouweiller found himself in the same position standing under the burled arch in Nome. Chad was the 61stmusher to cross the finish line at 5:22 on Sunday morning, March 19th. Standing with his mother and handler, Martha Schouweiller, Chad seemed to be at a loss for words too. He said, “Mom you can’t believe what it’s like out there – it’s just… it’s just unbelievable!” Chad was clearly thrilled with earning the coveted belt buckle as a rookie finisher but he was also deeply awed by the beauty and challenges he experienced during his 13 days on the trail. Chad just couldn’t find the words to describe his journey with his dog team. My adventure on Iditarod’s learning trail began one hot summer afternoon. I checked the Iditarod website to see who was signed up for the 2002 Iditarod. While on the site, I also noticed the Teacher on the Trail tab. Looking into that further, I was surprised to find there was a teacher who actually went out on the trail, created lessons and acted as a link from the trail for students and teacher as they followed the race in their classrooms. Of course, I sent for the application and was taken back by the description and requirements of the position. I was a veteran teacher, I was a dog handler, I’ve done some mushing and I’ve been a wilderness canoe guide but did I use the Iditarod in my classroom, did I know how to respond to animal rights activist who attacked the sport of mushing, did I have a vision for the Wells Fargo Teacher on the Trail program? No! If I was interested in pursuing what seemed to be a very unique opportunity in education, I first had to educate myself. I jumped at the opportunity to attend Iditarod’s Summer Professional Development Conference and spent a week with other teachers who wanted to learn about using Iditarod as a theme for education – many were neophytes like myself and others were veterans looking for new ideas and willing to share personal experiences. I returned to school in the fall with new and exciting ideas for my physical education classes and for my athletes. A year later, I found myself presenting at the summer conference. The conference participants were mostly elementary teachers with a few middle school folks mixed in. Most taught core subjects. I believed that Iditarod as an educational theme would be just as interesting for high school students as it was for younger students and just as valuable for students in physical education, art, marketing, foreign language and family/consumer education classes as well as athletes. Being that all of the previous teachers on the trail had been elementary teachers, I felt it was time for somebody to accept the challenge of expanding the teacher on the trail program beyond elementary reading, writing and arithmetic. That was my goal as I applied to be the 2006 Wells Fargo Teacher on the TrailTM. During my year as TOTTTM and as I journeyed to Alaska, I focused on a few important goals. First was to create a wide variety of lessons appropriate for secondary use as well as elementary. Second, I wanted to expand student awareness of Native Alaskan culture. Thirdly I hoped to enlighten students regarding all that goes into preparing for the race well before the countdown at the ceremonial start. Finally, knowing it would be a challenge to locate Internet, I hoped to post daily so that students could have a new message from the trail every morning. Looking back on this tremendous adventure, I’m happy with the progress I made toward reaching these goals. It’s very difficult to select just a few experiences from the Iditarod trail to share or to summarize my journey. Everyday of the 4 weeks that I spent in Alaska for Iditarod XXXIV was filled with meaningful memories. Here are a few stories that highlight my experiences during the time I was on the trail but by no means do they capture the whole adventure. The weekend before “Big Iditarod,” the juniors have their Iditarod. With heavy snow falling, the 14 – 17 year old mushers departed Willow heading to Yentna Station. Planes were grounded but I was fortunate enough to be a priority person and traveled to Yentna via snowmachine. Robert Tikitum, Jr. was mushing a team owned by the Yupiit School District in Tuluksak, AK. The whole school is involved in the care and training of the team. It is a tremendously valuable experience for the children at the school to realize that customs and ways of living dating back to early ancestors have a place in modern life. Robert was chosen as the musher because he had the most experience of the village youth in mushing. Robert was one of 23 mushers in the Junior. They were all diligent as they tended to their dogs after arriving at Yentna. It stopped snowing, the skies cleared and the temperatures plummeted. It was the job of the first junior in to Yentna to build the bonfire for all the mushers to enjoy. At 3:18 the next morning, after an 11-hour mandatory layover, with the temperature at 30 below, Rohn Buser left Yentna followed closely behind by Micah Degerlund, Ellen King and defending champion, Melissa Owens. Degerlund was the first to reach the finish line in Willow. Except for short jaunts between the airstrip and village checkpoints, that was the only time I traveled by snowmachine. The bush pilots of the Iditarod Air Force transported all Iditarod personnel to wherever they were needed. For the most part, I flew with Iditarod photographer Jeff Schultz. Being where Jeff was, I was always in the midst of the action along the trail, even if it was pretty cold getting there. With Danny Davidson as our pilot, I usually sat in the back jump seat directly behind Jeff. He took a lot of photos from the air. To do so, he opened his window leaving me to experience the full blast of frigid air. When Jeff thought it was a worthy photo opportunity, I snapped a picture too. I learned to wear my warmest clothes when flying and have my camera ready at all times. It doesn’t make any difference where or what you teach, teachers always have things in common. While in Nicolai, McGrath, Takotna, Ruby, Galena, Unalakleet and Nome, I took advantage of Internet access at the schools and felt fortunate to visit with the people living and teaching in those communities. Depending upon the size of the village, some schools are larger but others have less than 20 students grades K thru 12. In the small schools there might only be 1 or 2 teachers. Some villages have no school whatsoever or perhaps just grades K thru 8. Where there is no school, the students are home schooled or when they reach high school, some students attend the Galena Interior Learning Academy where they can finish high school and receive technical education as well. In Takotna, a village of 55, every man, woman and child worked in some capacity as a volunteer for Iditarod. The school age kids worked for 12-hour shifts raking and bagging the straw bedding left behind by the mushers. The children worked hard and took pride in a job well done. I raked straw with the kids and heard lots of great stories about school and life in their village. While in Ruby, I had the humbling opportunity to meet Susan Butcher and Emmitt Peters, both former Iditarod Champions. 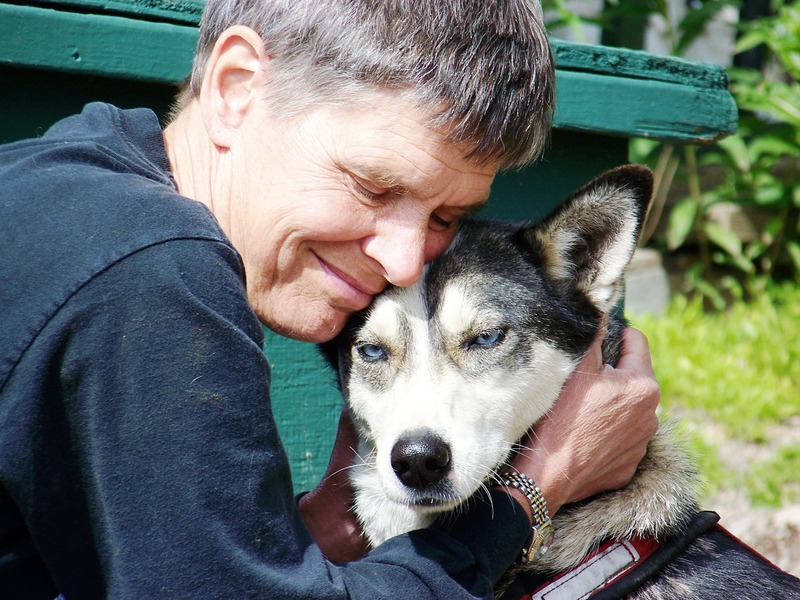 Susan, a four time Iditarod Champion who a waits a bone morrow transplant in her fight against Leukemia was acting as a volunteer checker. Susan has long been a role model for girls and women thru being successful in the largely male dominated sport of mushing now offers a new perspective as she fights cancer which she cays is a formidable but definitely beatable opponent. Best wishes Susan as you continue the fight to regain your health. Emmitt Peters won the Iditarod in 1975 as a rookie. He has run Iditarod a total of 12 times and placed in the top 10 in eight races. No wonder people consider him to be the “Yukon Fox.” Billy McCarty, Sr. was one of the serum runners who carried the precious cargo in 1925 from Ruby to Whiskey Creek. I met his sons Billy Jr. and Pat. Every village along the way had colorful and knowledgeable individuals who were living historians of The Last Great Race. What an opportunity to listen to their stories! The dog teams faced fierce winds as they worked their way down the Yukon River toward Unalakleet on the Gold Coast. I was fortunate in that the weather cooperated, winds died down to just 30 mph sustained with gusts to 40 mph, allowing the Iditarod Air Force to land at Unk in time to greet the first musher to reach the coast, Jeff King. I was on hand for the presentation of the award along with $2,500 dollars in golf nuggets! The Students of Unalakleet were very involved with activities at the checkpoint. Their student broadcast team interviewed mushers, veterinarians, race officials, Iditarod volunteers and spectators. They also shot video footage of activities in and around the checkpoint. The clips were edited and used during the Bering Strait School District’s videoconference project. This project truly demonstrated the use of Iditarod as a theme for education. Awesome! As the teams approached Nome, I realized that my time on the trail would soon be over. Nome was a very exciting place to be. I was there to cheer for Jeff King as he crossed the finish line as Iditarod XXXIV champion as well as all the other winners as they came up Front Street and crossed under the burled arch. It was a victory for every dog team that completed the race. Even though the mushers had all traveled the same route, their individual experiences were completely unique. Some were there to pursue the championship; others were there to learn the trail, others to gain experience for a puppy team, others to test themselves and their dogs and others for the sake of renewing memories from previous runs. To say the least, it was a spiritual experience for all who made the journey. It was a journey that affected me personally, professionally, and spiritually and more than likely in ways I have yet to realize. A sincere thank you to those businesses and individuals who provided me with money, goods, services, mentoring, collaboration and friendship. Thanks to Wells Fargo and the Iditarod Trail Committee for investing in education by supporting the Wells Fargo Teacher on the TrailTM program. In ways that may never fully be understood, your investment brings education to life for students around the world. Thanks to my employer, the Eau Claire Area School District for realizing the extensive impact of the Teacher on the Trail program and allowing me to teach well beyond the walls of my classroom and boundaries of our school district. Teacher on the Trail isn’t a 365-day adventure. It continues for a lifetime and I look forward to sharing my ideas and experiences in new and exciting ways in the future.